Hyderabad, Mar 11: The Telangana Congress is facing a disastrous situation after the Assembly polls as, within three months, three MLAs had left the Party and fled into the TRS. In these situations, the Party has taken a strong decision to boycott the MLC elections as it didn't have the desired strength to contest. 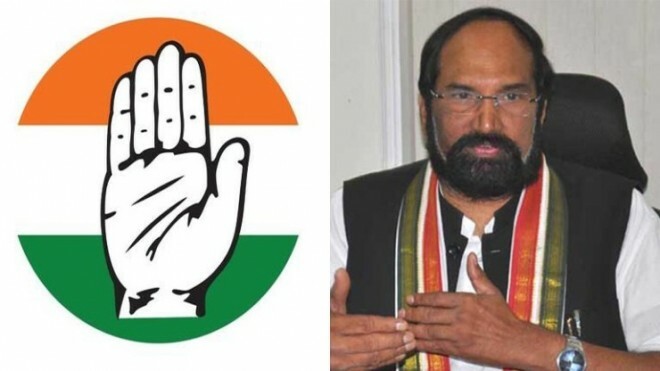 TPCC president Uttam Kumar Reddy said that "We are boycotting the tomorrow's MLA quota MLC elections. The decision was taken in the awake as all the arrangements were completed for the elections. On the other hand, the TRS party is conducting Mock polling for MLA's in the party office to create awareness on voting in the election." Uttam commented that "After coming to power for the second time, we expected KCR to behave as an intellect but now with the recent developments, there is no doubt that it was not going to be different. The Chief Minister was being criticized by the people for making these shameless, encouraging things to divert Congress leaders into TRS party. We thought we will win a seat in the MLC election as per our strength. But KCR is demoralizing the democracy. We are boycotting elections as a protest against the CM." He expressed his concern that TRS is not changing its way even after we have supported them in speaker election.